In December, Jimmy and I took a much-needed vacation to a place where we can just relax and recharge our batteries – Puerto Rico. This was our third trip to the island, so it may surprise you that this destination now ties with both Ireland and England for the number of visits we have made. We seem to have a thing for islands. 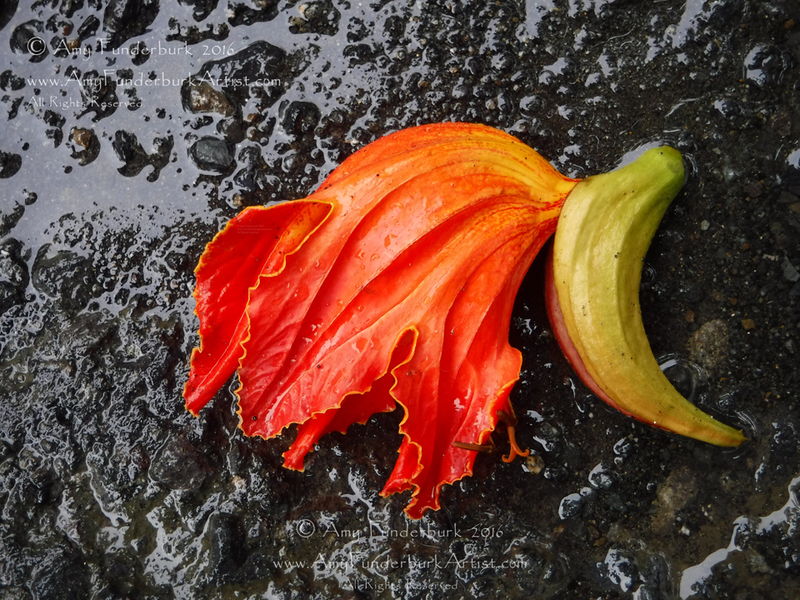 Even though this wasn’t a working art trip, you can’t turn off being an artist – it is in your soul, and always takes hold when you see inspiration. The muse of Puerto Rico never disappoints. 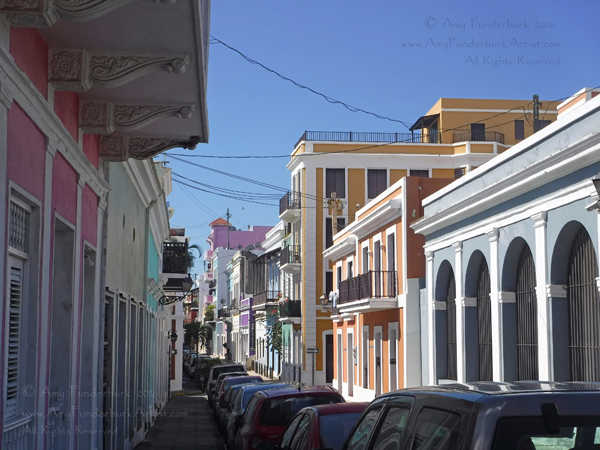 The narrow, cat-filled, cobblestone streets of Historic Old San Juan are lined with textured color: the crumbling decay of buildings perhaps kissed by one too many hurricanes stand side-by-side with restored, repainted beauties, all from a by-gone Spanish colonial era. Without staying here any longer than they seem to, I don’t know how the day-tripper cruise ship tourists can get a true feel for this vibrant city. This time, we took in Castillo San Cristóbal, conveniently located just a couple of blocks from our bed and breakfast. There was a small arts and crafts fair happening there during our stay, and two of the fort’s stately iguana invaders made for fascinating models. One of these scaly friends may aspire to be the basis for a dragon one day! One night after dinner, we took a stroll down to the side of the fort, lit only by the cool, almost-full moon on the ocean side, and just a bit of golden street light spilling over on the right. 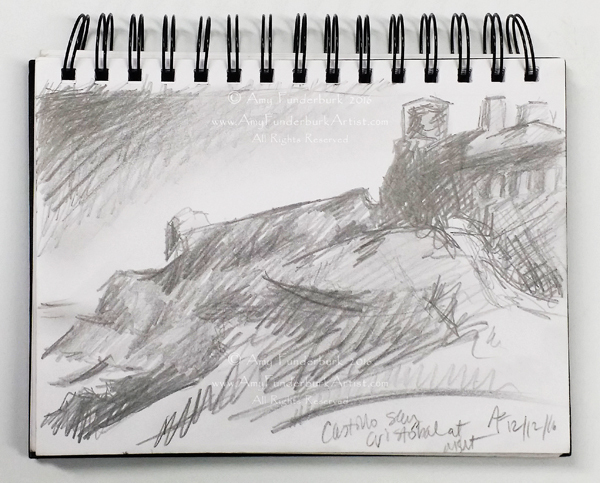 Inspired by the limited range of low key values I could discern, I decided to invoke the Victorian expat artist Whistler and think “Nocturne!” as I quickly drew the 15 minute sketch shown below. Considering just the touch of light I had to work by, I didn’t really know exactly what I had until I returned to our room! When I saw the drawing, I felt I had responded to the values and shapes in a rather energetic way. As I worked, I couldn’t help but think of the Old Masters creating by candlelight. However, I’m in no danger of reenacting the legend of van Gogh wearing a halo of candles around his straw hat. As our top pick for artistic inspiration in Old San Juan, the sheer magnitude of the Cementerio de Santa Maria Magdalena de Pazzis makes it a don’t miss – this was our second visit. Dramatically situated above the ocean, these large grounds are awash with statues of angels and stone mourners. 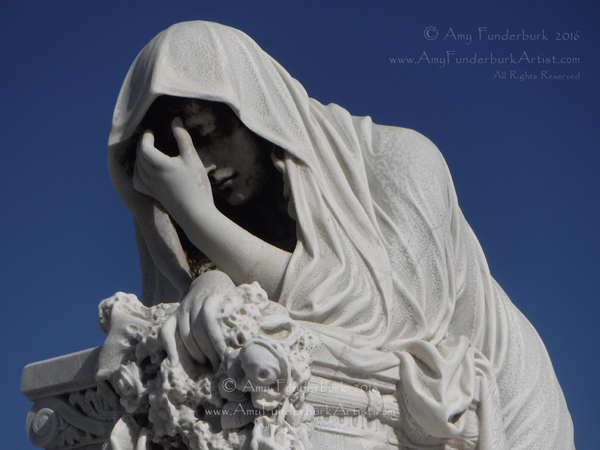 I have yet to visit the renowned cemeteries of Paris, but this Cementerio has set that particular bar quite high. The oldest section of the cemetery dates from 1863. After photographing just a few potential candidates from among the many beauties there, I spent the afternoon under a hot sun with the figure shown above, first executing a pencil drawing to warm up, then honing my watercolor skills with some painting studies. It was here under the bright blue Puerto Rican sky that a preference for my beloved panel surfaces by Ampersand swelled to the devoted level of a firm and lasting commitment. As I worked, I completely gave up on the watercolor block produced by a leading manufacturer after it refused to perform remotely how I expected. It simply would not tolerate my predilection for scrubbing and lifting (isn’t that just like an oil painter? ), unlike the tolerant Aquabord and Encausticbord Ampersand panels. Indeed, these panels seem to revel in my oil painter-like behaviors. 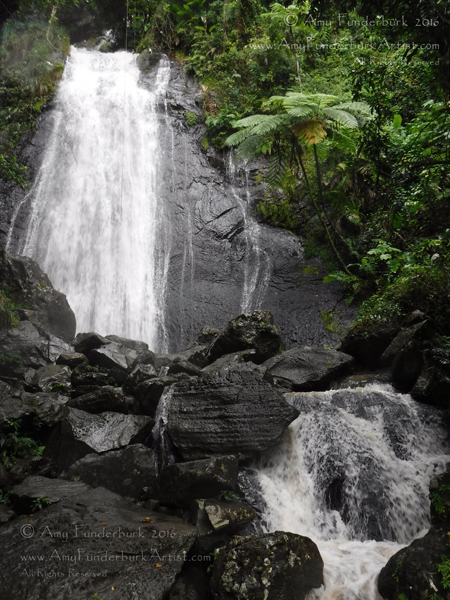 In the El Yunque Rainforest, even if you aren’t up for a hike, you can enjoy lush natural beauty from your car as you drive down the PR 191. Several waterfalls, most notably the impressive La Coca Falls pictured below, are right by the road. 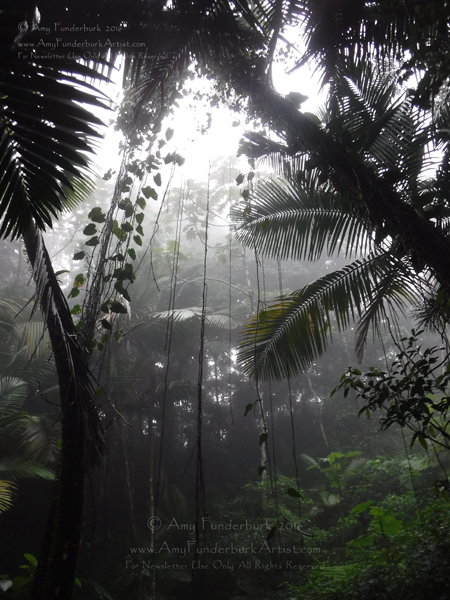 As home of Yuquiyú, the indigenous Taíno tribe’s “Good God,” El Yunque is sacred ground. To protect his people from destruction, Yuquiyú was said to do battle with Guabancex, the fierce Goddess of storms and chaos; her storms were the Juracán. 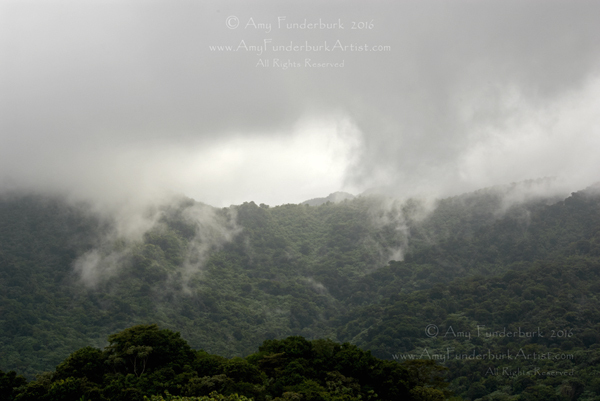 Indeed, the mountains of the El Yunque rainforest do just that, acting as a hurricane barrier to the land beyond. The Yokahu tower stands guard beside an impressive overlook with a view all the way to the coast. From the top of the 69 foot tall tower, we could see the Los Picachos and El Yunque peaks in one direction, but the real show was happening around the Pico del Oeste, the West Peak (above). Jimmy realized what we were witnessing – the actual formation of clouds as the sun dramatically sucked up moisture vapor in slow, snaking tendrils. When the light would occasionally break through the sun’s fast-moving, thick cloud collection, it was pure magic. My very quick watercolor pencil sketch felt like a meager attempt to capture just the essence of this ever-changing weather drama in action. This cloud nursery is the very reason they don’t call it a sunforest, however. As soon as we began our hike down the Big Tree Trail, the rainforest began to live up to its name. After remembering the old travel adage that it’s about the journey rather than the destination, my perception changed to one of appreciation. I immediately began to notice how eerily limited the depth of visibility was within the canopy of surrounding lush vegetation. We were inside the moisture-laded clouds. You can see what I mean in the photograph below. Art supplies stuffed into my backpack remained unused – nothing like soft rain to impede the creation of a watercolor. 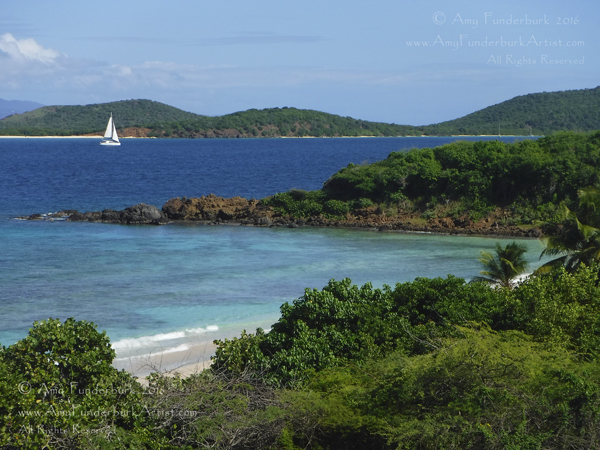 After leaving Old San Juan, our next stop was one of the smaller remote islands off the coast of Puerto Rico. It takes a bit of extra effort to get there, which is part of what keeps these islands from getting too commercialized. Staying in such an off-the-beaten-path location can give you a different perspective on the elements, even if you are someone who tries to stay in connection with nature as much as possible in a modern world. Before we left, I was sure to purchase a wide range of watercolor pencils in those saturated blues and greens that unmistakably say “Caribbean.” Of course, snorkeling gives you a window into a remarkable world fit for sprites and mermaids that you can never imagine if you only look at the surface of things. 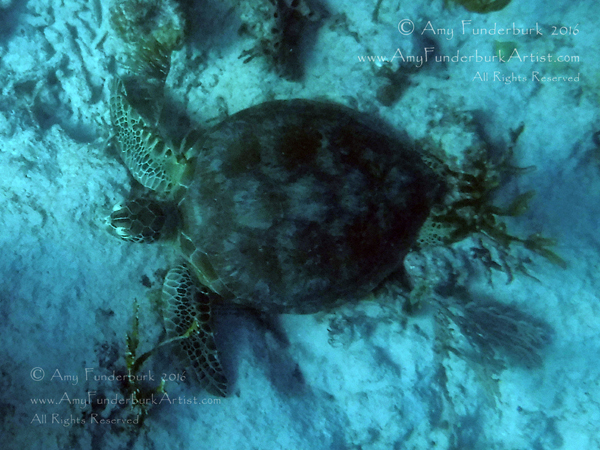 Not to mention, a chance to swim with the unassuming underwater rock stars – the sea turtles! While you might not normally want any rain during a vacation, after a few days without it, I began to wonder about the water level in our cistern. We welcomed the pattern of quick-moving, brief afternoon showers that started midway through our stay, knowing that they replenished our supply. Of course, these rains are carried on wings of air. While the trade winds alleviate the need for air conditioning or a clothes drier, when it is strong, the wind is a magpie that likes to steal things. It pulls clothes off the line, hides papers in corners, and folds yoga mats into origami. It also stole a bit of my sleep. A couple of days into our stay there, the wind got so loud at night that I repeatedly woke up. A pair of earplugs later and this was sorted, but it certainly gave me respect for what it must be like to wait out a hurricane – an infinitely larger proposition than just the harmless rush of a noisy, thieving gale. At night, we could see the Milky Way, and more stars than you could ever count. 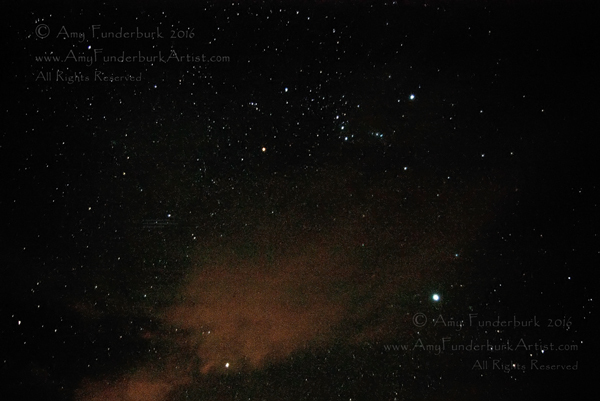 My old friend Orion was easily recognizable in the Winter Solstice sky, and perhaps brighter than I’d ever seen him. I could even discern the Orion Nebula without a telescope as the fuzzy middle “star” in his sword. The only light pollution was the warm glow of St. Thomas, one of the US Virgin Islands, at the horizon. We had the seasonal visual cues of charming holiday decorations, some a bit weather beaten and sun faded. But who knew winter could look like this? Suffice it to say that we didn’t miss the bitter cold snap that hit home while we were in this tropical paradise. But even though the first day of winter here was quite warmer than what I am accustomed to, the days felt noticeably shorter in this place where we wanted to spend all of our time outside. This is how we were able to mark the season. Somehow, my conceptual experience of the elements on this trip is going to make its way into the broader scope of my work. Going beyond your daily routine to color outside the lines of life can lead to wondrous experiences that are rich creative fodder. 1 Mas agua – Spanish for “more water”; supermercado is a supermarket.